Bathroom countertops Dallas are available in more shapes and materials than ever before. Modern cutting and fabrication techniques mean that anything is possible, in any size. Apparently, granite, the dense rock produced by ancient volcanoes, has become one of the preferred substances for countertops. They quarry the rock from a mountain, cut it in the shape you specify, and ship it to you. Granite bathroom countertops can be cut in any dimension and stained in nearly any color. Thousands of satisfied customers find them to be the perfect accessory for their modern homes. Keep in mind that granite is non-porous. 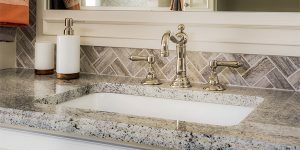 This is one of the biggest advantages if you install bathroom countertops in granite over other types of countertop materials. It is a material that does not harbor bacteria. It does not even allow residue to collect in microscopic areas, something that wooden countertops do. This happens because of the porous nature of wood. They must be regularly disinfected. This reduces cross-contamination and other undesirable occurrences. Granite bathroom countertops in Dallas are sealed when properly installed. This adds another layer of protection against bacteria. This also fights other undesirable features. It makes these countertops even more inhospitable for bacteria. Granite is durable. It is likely that granite countertops would be one of the few things left standing without any maintenance to age. These countertops are designed to withstand constant use. They require only minimal maintenance. This allows a solid granite countertop to last for decades. It is only important to be installed properly. It is true that granite bathroom countertops can sustain damage. This damage can be in the form of stains or scratches. Stains can be prevented through regular maintenance. It includes a yearly sealer application and cleaning any acids from it. Scratches, chips, and other minor damage can be repaired in the area by an expert. Moreover, heat does not bother Dallas granite bathroom countertops. They simply tend to be incredibly resistant to any excess heat. The density of this countertop material mixed with the larger surface area of a countertop gives it this quality. This is actually thanks to the natural process of liquefaction and hardening of lava, allowing the natural stone to develop a variety of patterns and tones. This gives you a variety of options for your bathroom. And with a selection of patterns to choose from, you can effectively boost the existing design of the area. Are you on the market for some premium-grade granite bathroom countertops in Dallas? Give us a ring now at Hard Rock Imports. We are more than happy to give you a free design estimate. Just let us know what you need and our experts will be there to assist you.